Stuck for a Valentine's gift? How about a gold bar designed by Gaultier? Yes, Jean Paul Gaultier is now designing gold bullion – in handy 1oz bars for the spoilt other half in your life. $1,850 of Jean Paul Gaultier's latest creation: literally worth its weight in gold. NO NEED TO PANIC, but Valentine’s Day is only 25 days away – but if you haven’t though of a present yet, and you’ve got some special you want to spoil, we might have the answer you’re looking for. There’s one catch: you must be really, really, really rich. Forget the time-honoured tradition of buying jewellery, and instead spend the money on a bar of solid gold. 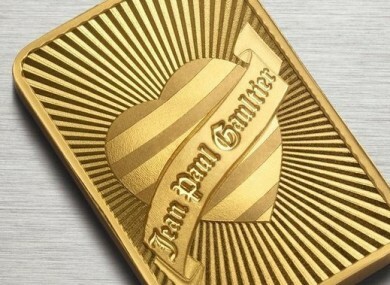 French haute couture designer Jean Paul Gaultier has teamed up with a Texas-based commodities trading agency Dillon Gage to design a limited run of custom-designed gold bars. Weighing a mere 28g – one ounce – each, the bullion bars feature a heart with Gaultier’s trademark sailor stripe, overlaid with a banner featuring the words… ‘Jean Paul Gaultier’ (he’s predictable that way. Only 5,000 of the bars are being made. “Never before has a fashion icon designed a gold ingot,” tooted Dillon Gage Metals president Terry Hanlon in a press release. The Gaultier bar is a one-of-a-kind, limited-quantity collector’s piece that not only is a great investment but it will also become a a piece of history [...] The Gaultier one-ounce bar is the perfect Valentines, birthday or graduation gift for someone special. When he says ‘special’, he means it: as you’ll probably have heard, especially given the tumult in the financial world these past few months, gold doesn’t come cheap. Today you could buy an ounce of gold for $1,664 (€1,228) – so, including its own markup and a fee for getting Gaultier to design the bar in the first place, Dillon Gage want you to hand over $1,850 (€1,432) for each bar. The perfect gift for the needy, spoilt other half who already has everything. Email “Stuck for a Valentine's gift? How about a gold bar designed by Gaultier?”. Feedback on “Stuck for a Valentine's gift? How about a gold bar designed by Gaultier?”.